A former Iowa Hawkeye football player who went on to be a star in the NFL and on television has died. 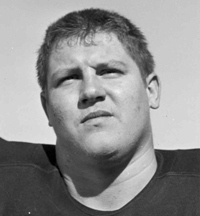 Alex Karras was an Indiana native who played college football at the University of Iowa. Karras, a defensive tackle, was the runner-up in the voting for the 1957 Heisman Trophy. He played professional football for the Detroit Lions and retired in 1970 at the age of 35. Karras was a co-host of “Monday Night Football” on ABC for three years and had success as an actor. In the 1974 movie, Blazing Saddles, Karras played Mongo — a character who punched out a horse in a memorable scene. Karras played the sheriff in the 1982 movie “Porky’s”. Karras also starred in the long-running TV series “Webster” — portraying a retired professional football player who adopted the child of a fellow player. The woman who portrayed his wife on the show was married to Karras in real life. Karras and his wife joined 69 other former NFL players in filing a lawsuit against the league earlier this year, arguing the NFL did not properly warn players of the risk of returning to the field after suffering a concussion. According to a family statement, Karras died after “a heroic fight with kidney disease, heart disease, dementia and, for the last two years, stomach cancer.” He was 77 years old.